Zhengqing Hu, M.D., Ph.D., has received his first R01 from the National Institute on Deafness and Other Communication Disorders to analyze hearing regeneration using stem cell approaches. Dr. Hu, an assistant professor in the Wayne State University School of Medicine's Department of Otolarygology - Head and Neck Surgery since 2009, is the principal investigator on the renewable $1.6 million grant (1R01DC013275-01A1) over five years, for the project "Regeneration of auditory synaptic contacts using stem cell based approaches," starting May 1. The National Institutes of Health estimates that approximately 26 million Americans ages 20 to 69 - 15 percent of the population - have high frequency hearing loss. The severity increases rapidly after age 50. "Hearing prostheses, such as hearing aids and cochlear implants, have been used clinically to treat these conditions, but the efficacy of these interventions is compromised by severe loss of auditory cells and neural contacts along the auditory pathway," Dr. Hu said. "Currently, there are no biological approaches to replenish human auditory cells and regenerate auditory contacts. This project utilizes stem cell-based approaches to regenerate the hearing system using an animal model. Completion of this animal study will be fundamental to future pre-clinical trials that aim to regenerate damaged spiral ganglion neurons and neural contacts along the auditory pathway. Identification of molecular mechanisms that are important for auditory contact formation not only will be fundamental to auditory pathway regeneration, but also will provide cues for neural contact regeneration in other sensory systems. The results of this study will provide avenues to explore and promote auditory circuitry regeneration to treat deafness and other inner ear disorders." 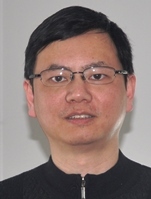 Dr. Hu and his team will focus on regeneration of neural contacts between stem cell-derived neurons and cochlear nucleus neurons using cell culture and animal models. "We will develop and optimize a co-culture model using stem cell-derived neurons and mouse cochlear nucleus neurons to study auditory pathway reconstruction. We will determine the molecular mechanisms that are able to stimulate the regeneration of auditory contacts in this project. When our cell culture and animal models are optimized, we will study whether the hearing function will be recovered in deafened animals," he said. The application of the R01 is based on previous research led by Dr. Hu and supported by an NIDCD R03 grant and grants from the American Hearing Research Foundation, the Hearing Health Foundation, the American Academy of Audiology and the Grants Plus Program from the WSU Office of the Vice President for Research.